HLTV – Where are house prices heading? Today we’re going to focus on house prices. A house is probably the biggest single investment most of us will ever make so understanding this rather dysfunctional market is really important. 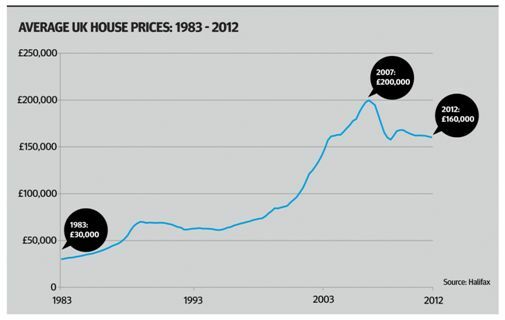 The chart shows how average UK house prices have performed over the last 30 years. Between 1983 and 2007, prices rose from around £30,000 to just short of £200,000. However that all stopped in late 2007, and prices fell significantly over the next couple of years. Although the overall decline has now slowed, prices continue to fall in many areas outside London, particularly in Scotland, the north of England and Wales. Despite the general fall in house prices, first time buyers are finding it increasingly difficult to get on the housing ladder. Five years ago there were almost 700,000 first time buyers. Last year there were just 193,000, a huge drop. The result is more people are renting. Around one in six families now live in rented accommodation, the highest figure since the 1970s, before the house price boom and more readily available mortgages. But what does this all mean? What is going to happen to house prices and mortgages? Will our children ever make it onto the housing ladder? Should we even be encouraging large mortgages – wasn’t that what got the economy into trouble in the first place? And what about buy-to-let; are there opportunities for investors there? Henry Pryor, an independent housing expert with over 25 years’ experience, Lucian Cook, Head of Residential Research at Savills Estate Agents, and Mark Dampier, Head of Research at Hargreaves Lansdown will help answer these questions. Q: Henry, I’d like to start by asking the question every homeowner in the country wants to know – where are house prices heading? Henry Pryor: Well, if ever there was a time to remember that past performance is not a guide to the future I think it is probably now. Thirty years of steadily rising house prices, with the odd blip in between, give us a reason to be cautiously optimistic about the future. There are some good reasons why house prices might be going to edge up in due course, which I will come on to later. But at the moment if you read the tealeaves for 2013, 14 and 15 there are significant hurdles ahead. I think house prices will continue to drift downwards for the foreseeable future. Q: Lucian, how do you see it? Lucian Cook: I think we are in for a period of relatively static prices. We have released our house price forecasts for the next five years and we are suggesting prices will rise by about 11% over the next five years at a national level. However, the market will divide into leaders and laggers. In London and the South East for example, you could expect total price growth of 20%, whereas if you are in the north of the country it might be somewhere between 5% or 6% over the next five years. Q: Mark, there is massive disparity in those figures. Where do you see house prices going? Mark Dampier: I am still amazed to hear two property people being slightly bearish. I have been fairly negative on property for at least eight or nine years and I suppose the two property experts will tell me I have been completely wrong. However, I just cannot see how property can do anything other than go down over the next few years. I have no idea to what degree prices will fall but the banks aren’t lending and that’s a big, big part of it. Interest rates are incredibly low and therefore affordability looks very good, but if you can’t borrow the money then that’s not going to help you. What’s more, eventually interest rates will start going up. I am already hearing people say to me that if interest rates were at 4% there would be a housing collapse. Are people going to be able to afford interest rates at 4% or 5%? I don’t think it is going to happen for another few years but eventually they will start going up, and then we are going to see homeowners really struggle. Q: Lucian, you mentioned a forecast of 20% price rises in London over the next 5 years, but why do you think house prices are so stagnant in other areas? Lucian Cook: One of the things we have to remember is the housing market is only partially functioning at the moment. Transaction levels are running at about 55% of where they would have been as a long run pre-credit crunch average, and the market has become incredibly heavily weighted towards people with lots of housing wealth. First time buyers control just 4% of the housing wealth in the UK whereas the over 55’s control about 66%. The market is essentially being controlled by people with housing wealth and this is limiting house price falls. We expect to see that continuing. So you have to look at the prospects for future house prices in the context of the shape of the market and that has changed quite dramatically since 2007. Q: So the market is being driven by those potentially older purchasers? Lucian Cook: Indeed, and when the recovery comes there is very little doubt it will be a top-down and not a bottom-up recovery. That means people in the lower tiers of the housing market will be renting more property for longer, and that starts to feed into the investment equation and dynamics for residential property. Q: Henry, how do you see it? Henry Pryor: First of all we need to recognise there is no one average number. Most commentators look at the national house price index every month, but the market is very fragmented. Over the last three or four years national house prices are down 6% or 7%, but that masks the great regional differences. London and the South East have seen prices increase across the board. In Wales house prices are down 14% since January 2007, and in the north west of England they are down 16%. So we have to understand there is a huge disparity and understanding that enables us to make informed decisions as a result. Q: Mark, what are your thoughts on that? Mark Dampier: One thing you need to bear in mind is that hotspots change. Devon and Cornwall were big hotspots until recently. However, over the last few years city bonuses have dried up and so suddenly, that’s changed quite dramatically. On the other hand, London prices have been boosted because of overseas buyers, particularly because of the euro crisis and the devaluation of the pound. This has made property prices look cheaper from an overseas point of view than from a UK perspective. Potential property investors need to take on board these things. They shouldn’t presume international buyers will carry on buying into London; if there is another disaster over in Europe or America, that might suddenly change and there might be a sudden lack of buyers. Q: Lucian, how would you respond to that? Lucian Cook: The prime London market has undoubtedly benefited from safe haven investment and it was kick-started by an exchange rate advantage. However, as we move into the next phase of the housing cycle, new factors will come into play. Global wealth generation in emerging economies is forecast to be very strong against the context of a supply-constrained London market. This suggests prices in prime central London will grow over a five year period by something in the order of 24%. Q: Henry, do you think we all have a rather over-inflated sense of what our house is actually worth? Henry Pryor: I’m sure we all do but it’s worth remembering and underlining it costs nothing to instruct an estate agent to come along and give you a view as to what you should be asking for your property. Often that will be done to flatter your ego because estate agents only get paid when transactions occur. If you want to sell, however, you need to pay far more attention to what is going on in the wider market. Q: And what about housing shortages? Are we building enough houses to cope with future demand? Henry Pryor: This is one of the unsubstantiated arguments. Popular myth suggests we need to build in the order of 250,000 to 300,000 houses to account for the backlog of under development that occurred under previous administrations. In fact, there is very little quantitative evidence for this. The way this country operates and the way elections are held means it is highly unlikely anyone is going to vote for vast amounts of additional house building. In my view we are far more likely to see a move by politicians to discourage people from wanting to live in high priced, overvalued London and the South East, whilst encouraging infrastructure projects in the Midlands and further north. Q: Lucian, how do you assess the housing stock? Lucian Cook: There is little doubt levels of housing development in London, the South East and perhaps the wider South of the country are too low in relation to demand. In other areas such as the North perhaps there isn’t the demand in the short to medium term to develop property. I think the other big issue is: what do we build? At the moment house builders are building for owner-occupiers which are smaller in number. This has left us with a generation commonly referred to as ‘generation rent’ for which we are not building enough private rented stock. That is probably the single biggest gap in the market and that’s where the investment market in residential property simply has to mature. The government are going to be really keen to see increased levels of house building because it’s a quick route to economic growth. Q: Henry, do you think the government is doing enough? Henry Pryor: It isn’t and it can’t. As Lucian rightly says, construction and house building in particular, is a superb tonic to get the government out of the present mire. It is swimming desperately against the tide but it is not only the private rented sector that is desperately short of new stock, but also social housing; there are three million people reckoned to be on social housing waiting lists. These people are crying out for accommodation, not just in London and the South East, and that is something that has to be dealt with. To its credit, the government has some plans to deal with it. However, it is still desperately difficult to find electoral benefit from suggesting to people you are going to build on their green and pleasant land. In addition, the mere fact of building these additional houses increases supply and potentially depresses values. Nobody really wants to see the value of their house under mined or the view that they enjoy from it spoilt. Q: Mark, do you think the government could be doing more to encourage people onto the housing ladder? Mark Dampier: I don’t think the government should be encouraging anything like that at all. In fact I don’t think they should be encouraging first-time buyers into the market because I think the outlook for house prices isn’t on the whole particularly good. Why as a government would you want to do that? It’s because everyone has a false idea of property. It’s nice to hear Henry say he doesn’t think there is a shortage of property; I don’t think there’s a shortage of property in the country at all. There are a lot of people who want to buy a house but that’s a different thing altogether. I don’t think the government should be trying to encourage first-time buyers with fancy schemes such as shared ownership. They are a recipe for disaster. People talk about property as a long term investment, which is fine. A first-time buyer normally wants to move within five or six years so it is not a long-term investment. If you have negative equity at the end of those five years, you’ve got a real problem. So in many cases if you are younger you are actually better off renting at the start and owning later. The government should be encouraging that because what you want is job mobility; you want people to be able to move around to find work. People won’t go to the North now to buy a house because they know if they do they will never be able to move back into London. That’s a crazy position to be in and that’s what the government should be addressing, rather than trying to get people to buy houses. The housing market is completely nuts in this country and has been for 30 years; it causes virtually all the economic downturns. Q: And how do you asses the buy-to-let market? Mark Dampier: I am not a buy-to-let person because I am not a property fan.There are certain hotspots where a buy-to-let may make a lot of sense, but I always find it really odd people think borrowing £100,000 or £200,000 to do a buy-to-let is a good idea. If I said that about investment and buying shares I would be toted off to the funny farm, yet with property that seems to be a perfectly reasonable requirement. If I am getting a yield of 5% or so from property that sounds quite good in this environment, but set against the fact I’ve got maintenance, liquidity problems and potential tenancy problems, I don’t see it being good enough compensation for me to do that. Q: Lucian, what are your thoughts on the buy-to-let market? Lucian Cook: We have calculated average gross rents in the UK of 5.8%, with net rents coming in at 4%. Set against alternative investment returns in the market, those stand up very well on an income basis. Over the past 30 years average returns on property run at something like 2.5% to 3% above the annual rate of inflation, so people need to take a medium-term view. A lot of people have generated housing wealth from investment in residential property. We also have to remember we are in a cycle of rising rents. We have great demand for people to go into private rented accommodation. This, combined with constraints on buy-to-let mortgage finance, is creating a supply-demand imbalance which is driving rental growth, despite the current economic position. If people slightly shift their attitude and look at the income-yielding potential of residential property, and concentrate a little bit less on the capital growth prospects, then in the context of a balanced portfolio there is still very much a space for investment in residential property. The term buy-to-let is perhaps overused; I think that relates much more to a mortgage backed product. The market will be controlled by the people who have got equity who are much less exposed to the risks Mark was talking about. Q: Henry, do you think property is still a good place to be for the professional investor? Henry Pryor: I am haunted by the mantras of the great property gurus of old who always told me as I was growing up and getting out of short trousers in the property market that you only really paid attention to a property if the net yield was 6% or more. Whilst we can see crazy gross yields in central London of 3.5%, or sometimes 4%, I think in general, buy-to-let investing makes a great deal of sense. The one thing we can all agree on is: it is incredibly difficult to find anybody who is bearish about rents. Rents should increase as there are lots of people who want to get in to the private rented sector; indeed, most of the new generation consider renting to be cool and they are much more comfortable with the idea of renting than owning their own home. With around 50% of all homes in the UK owned outright by the owner-occupier of that property there is, as Lucian said, considerable scope for people to invest in property that can then be let out. Mark Dampier: The 6% net yield that Henry talked about starts to make sense, but most of the time I see 5% gross yields which is not the same thing. I can get that on the stock market and get instant liquidity; I can buy and sell on any day but I can’t do that with a house. Also, a house comes with costs. Everyone seems to think that houses are free and don’t cost anything to maintain but they do, so you need to take a lot of other factors into account. A 6% net yield starts to make sense because you have a reasonable amount over to cover unexpected expenses, but a 5% gross yield doesn’t make much sense at all to me. Lucian Cook: I would imagine the difference between gross and net yields reflects the costs, so when we are talking about 4% that is a net figure, after costs of maintenance, potential void periods,letting and management fees. Q: I think I am quite guilty of thinking of my property as an investment for my future. It’s going to support me in my old age, and even potentially going to be a pension. Mark, is that a sensible point of view? Mark Dampier: No, I don’t think so. I think there are two factors you’re forgetting. First, people get emotionally involved in their house; if you have lived there for 20 or 30 years and have neighbours and friends around you, are you sure you really want to move? I would question whether you do. Second, you should consider how much money you are going to release in downsizing; if you’ve got a £3 million house then that’s fine but in most cases you don’t actually release much. If you manage to release £200,000 you would only get a yield of about 2% gross in a building society at the moment, so the idea your house is your pension is entirely wrong in my view. It also presumes you have got someone to sell your house to, and as many older people are suddenly realising, there are not many who necessarily want to buy their house at the price they want. Q: Henry, what are your thoughts? Henry Pryor: I don’t mean to be too controversial here but I think we must remember 12 million people own their house outright. Whether they sell it for their aspirational £3 million or £1.5 million, frankly, it doesn’t really matter. Those people have seen a much safer and more concrete financial future in the bricks and mortar that they also happen to enjoy living in. Those who have punted their savings in to the stock market have perhaps shot themselves in the foot for the foreseeable future. So, understandably, people are a little shy of handing over their future wealth and putting it in the hands of people who, over the last five years, have cocked it up and got it very, very badly wrong. Q: Lucian, how do you see it – is property an investment for our future and potentially a pension or is it just something to enjoy now? Lucian Cook: The thing about property is it fulfils a number of different roles; it’s an amenity, a necessity, and, part of it, an investment. I suspect there will be increased pressure to downsize. Downsizing undoubtedly tends to occur in higher-value bands because there is more pressure to do so, for example to mitigate your inheritance tax liability. My suspicion is we will see more downsizing, not necessarily to meet short falls in pension provision, but to pass housing wealth down generations and to help younger families work their way up the housing ladder. It’s going to be that transfer of equity between generations that will be a key driver, and different driver, of the next phase of the housing market. Q: If there was one thought about the housing market you could leave our leaders with today what would it be? Henry Pryor: We have got two views on this: the short-term and the longer term view. There are reasons, despite my slightly bearish approach, to be optimistic. For example, next year the government’s Funding For Lending Scheme is going to release between £5 and £10 billion into the mortgage market. This is going to have a demonstrable effect, both on turnover volumes, which have never been lower, and on house prices, which are predicated on the availability of finance rather than supply and demand. So I think there are reasons to be optimistic about house prices if you want to see house prices either being maintained or rising slightly through 2013. Longer term, I simply don’t think the man on the Clapham omnibus is ready for wholesale building across London and the South East. As a result, the supply of new properties isn’t going to grow fast enough to keep rents under control. Investors are going to benefit from that, both in the rented sector and as owner-occupiers. Lucian Cook: I think it is essential to separate short-term from medium to long-term issues. If you are prepared to take a medium-term view on the ownership of your property, then I think it is a relatively safe and secure bet. However, there will be volatility in the short term, and you need to make your investment decisions or your simple house purchase decision against that context. Mark Dampier: I am all in favour of property. I probably sound like I am not a property fan at all. I think property ownership is wonderful, but I don’t believe it is an investment or a pension. If it turns out that way then great; that’s a bit of extra cream if you want. But that’s all it is – don’t think of your property as a pension because by and large I don’t think it’s going to be. Important Information – The value of investments can go down in value as well as up, so you could get back less than you invest. It is therefore important that you understand the risks and commitments. So you can make informed decisions for yourself we aim to provide you with the best information, best service and best prices. The views expressed are those of the speaker and do not necessarily reflect the views of Hargreaves Lansdown.